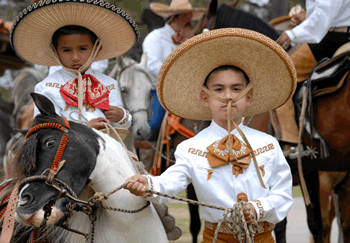 Ever since the first Old Spanish Days Fiesta in 1924 a “Competencia de los Vaqueros” was the highlight of the festivities. Cowboys from surrounding ranches, together with other horsemen, took part in a Saturday afternoon riding and roping exhibition. The show was held in an arena at Pershing Park, now the site of the Carriage Museum and ball fields. By the 1930’s the show was renowned throughout the western riding community. The arena was jammed with 5,000 horse fans eager to watch as over 200 entrants from Salinas to San Diego demonstrated their skills at roping, cutting, racing and bronco riding. The show drew so many contestants that classes were divided into northern and southern California districts. Elimination rounds were held all day Friday with the finals on Saturday during a five-hour program. A quote from a 1937 edition of the Santa Barbara News Press states that during Fiesta, “Once again the faithful and prized friends of men enjoyed the importance and respect that was theirs in the real Old Spanish Days when a good horse was a man’s right hand without which he was powerless to cope with the distances and problems of his frontier environment”. In 1958 the Stock Horse Show moved to Earl Warren Showground and a professional rodeo was added. Professional Rodeo Cowboy Association athletes from all over the West came to Santa Barbara to compete. The Horse Show was expanded to include a variety of classes giving riders and ropers of all ages and ability levels a chance to show their skills. The Fiesta Stock Horse Show continued to attract riders from the Tri-Counties area and it continues to this day.